Sports Need A Better Playbook For Suspensions There is no rhyme or reason for how suspensions are handed out in sports, according to commentator Frank Deford. He thinks it's time for that to change. 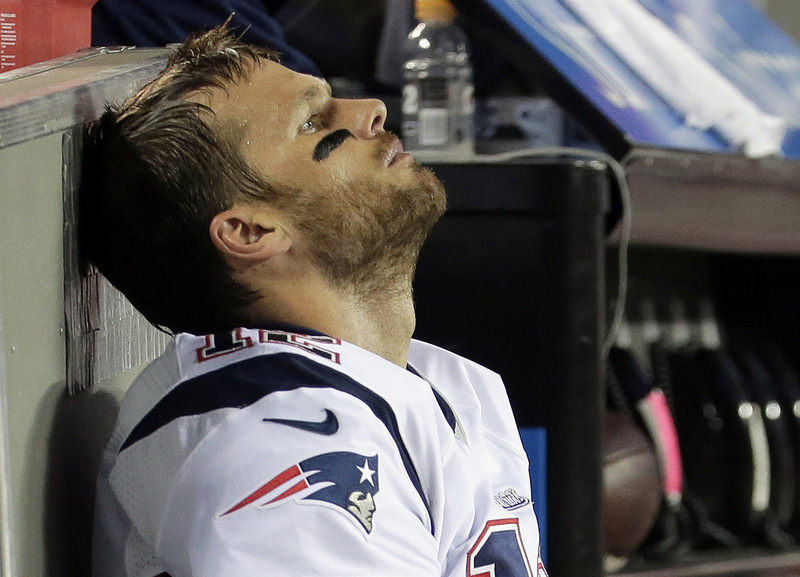 New England Patriots quarterback Tom Brady sits on the bench during the fourth quarter of an NFL football game against the Kansas City Chiefs, in Kansas City, Mo., on Sept. 29, 2014. Brady will be forced to sit for the first four games of 2016 serving his "Deflategate" suspension. Since too few Americans go to the polls, I say what this country needs is a bobblehead election, where voters will get free bobblehead dolls of their choice when they show up and vote for president. Hey, it works in sports. And what sports needs is some kind of uniform, sensible policy relating to suspensions. There're just more and more suspensions for more and more reasons, but the length of suspensions seem so random. 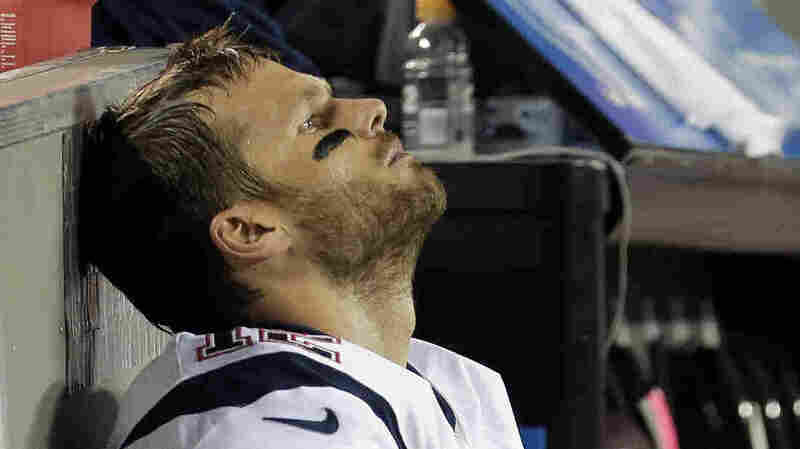 To begin with, although the NFL season starts Thursday, the Patriots' sainted quarterback, Tom Brady, must sit out four games, suspended because he was "generally aware" of a nefarious plot to deflate footballs in a playoff game. Meanwhile, athletes in all sorts of sports are being suspended for taking performance enhancing drugs, and it seems like it's almost part of the job description for football players to commit domestic mayhem and get suspended arbitrarily. The Giants have a kicker named Josh Brown, whose ex-wife says he beat her up more than 20 times, so he's getting suspended for one game. Baseball players who slide maliciously into second base now get suspended, too. The most famous offender, Chase Utley, got suspended two games. Then we have Hope Solo, the belligerent goalie for the U.S. women's soccer squad. She was handed a six-month suspension for expressing an unattractive opinion about another team. So far as I know, this is the first time an American athlete has been suspended merely for freely expressing her opinion. Whatever you may think of Solo, her suspension sets a terrible precedent. Of course, suspensions are nothing new. All sorts of famous sports people have been suspended for extended periods. Ryan Lochte Just Wants To Dance, Apparently — With The Stars! I think the four major leagues ought to set up a joint commission –– say, of retired judges –– to rule on athletes who are accused of doing bad things away from the game. Then each league would retain its independence in determining what penalties their players should get for infractions committed within the sport. Oh, and don't forget to watch that vandal, Ryan Lochte, suffer for his behavior: competing on Dancing With the Stars.